As I excitedly blogged about earlier this week, I recently learned about an opportunity that would not only allow me to do showcase my passion and enthusiasm for running, social media and traveling, but also represent two very prominent brands in the process: Westin and the Rock ‘n’ Roll Marathon Series. First race: Chicago – this is the finalists’ trip (where the position is narrowed down from the last three contestants). I have never been there, but this would be the perfect opportunity to show just how well I can plan a trip to an unknown destination! Plus, what’s better for carbo-loading than some real deep dish pizza? Virginia Beach, VA: 9/1/2013 – this would be a fun trip, since I have run around the VA Beach area in a few different races, most notably the Shamrock Marathon and the Wicked 10K. It’s always a festive atmosphere and definitely one of the flattest places I have ever run! Philadelphia, PA: 9/15/2013 – can you say post-race PHILLY STEAK SANDWICH? Hah, really though, I am a huge Philly fan since our visit last year (trip recaps Part 1, 2 and 3) and running around Kelly Drive is one of my favorite places ever. Montreal, CN: 9/22/2013 – Oh Canada! I am a fan of traveling to and learning about foreign lands, and yes, Montreal would be quite an adventure to me, as I have only been to Western Canada (Victoria, B.C.). Providence, RI: 9/29/2013 – Believe it or not, New England is another locale I have not traversed. Discovering a new region on foot is always a satisfying quest, so this would be right up my alley. Cleveland, OH: 10/6/2013 – Where better to rock than the ‘Heart of Rock’n’Roll” of Cleveland?! Where, I ask you!? Los Angeles, CA: 10/27/2013 – There’s always a good reason to visit LA, and this event sounds like it’s no exception. Marketed as a “Halloween” Marathon, I cannot help but imagine what fun costume I’d wear. St Louis, MO: 10/27/2013 – as silly as it sounds, I’ve always had the desire to see the St Louis Arch in person – and luckily for me, the course description denotes incredible views of it! Savannah, GA: 11/9/2013 – another one of those lovely cities that I’d love to visit! 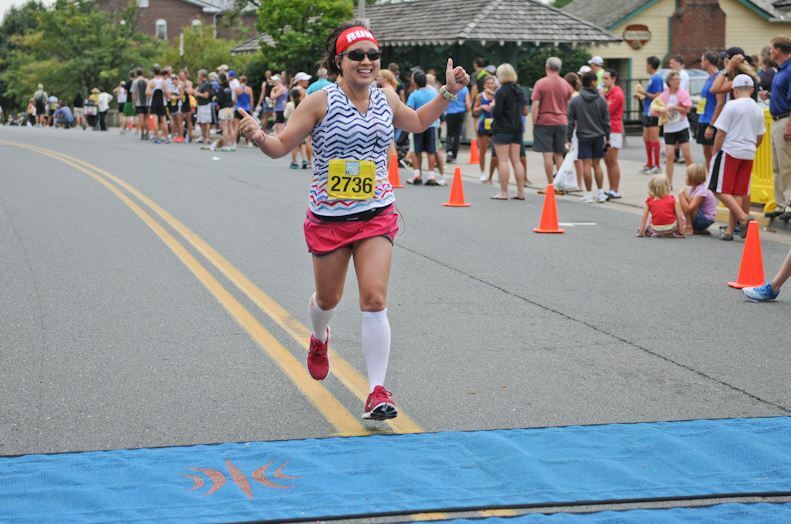 I read recaps of this event from several of my favorite bloggers, including Dani, who ran her then marathon PR and quickly added it to my bucket list. Las Vegas, NV: 11/17/2013 – probably one of the most famous races around, I’ve been following this event for quite some time – and with the slogan of “Run the Strip at Night!” how could you not? This race takes place four days before hubs’ and my anniversary, so this could be the perfect opportunity to plan an extended racecation. 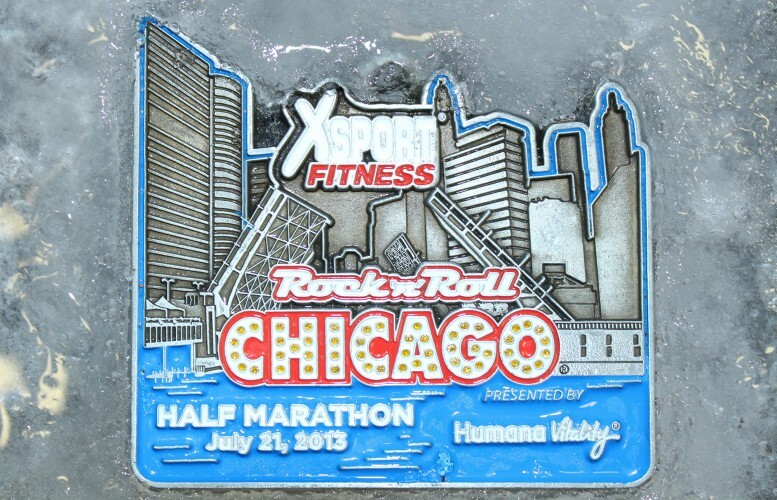 For those very motivated individuals, the Rock N Roll Marathon Series features a neat way to get your races in: the Tourpass! For $399 (plus processing) you can pay once and pick all your “stops” over the course of a year. See this page for terms and conditions – sounds like a pretty sweet deal to me! I saw that post, way cool!! I’m actually already running a bunch of these. Love the RNR series!! Good luck. yup! Chicago was supposed to be next, but I think I’m out. VA Beach is after that 🙂 then NYC! 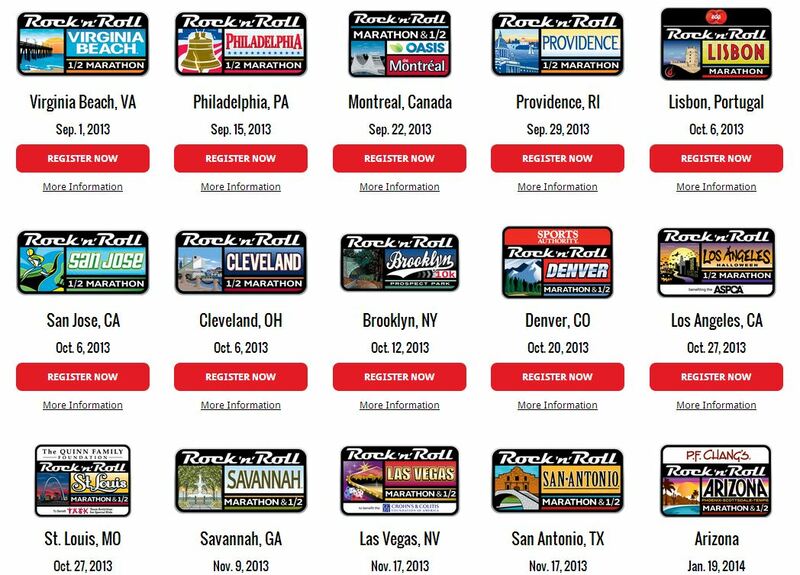 I originally wanted to run every Rock N Roll 1/2, but now I think that there are too many! I haven’t run any of the RNR series, but I would love to do the one in Savannah. Maybe next year! I love that you gathered all of this information in one place! You are demonstrating your stellar ability to get the RunWestin job done! Westin are reading?? BRING THIS GIRL TO CHI town!! Hmm.. you could probably convince me to do a 5k but i don’t know about a half marathon or marathon!! Either way, I’d drive the hour and stay up in SA to support you and we could have a great time at the river walk/bachelorette party! This would be an amazing job!! Am thinking of registering for RnRNOLA with today’s discount! I did RnR Vegas last year and it was amazing!!! Running the Strip at Night definitely lived up to the hype. Now that I’m moving to St. Louis, I’m hoping I’ll be able to do RnR St Louis. I saw the post on Westin and thought of you! Good luck! If you get the gig, I might have to come down to Savannah!